Apple May Reach New High in Early iPad 2 Sales! Apple Insider is reporting that Apple may reach the 1 MILLION mark in iPad 2’s sales by this weekend! DEWD! “With expanded availability, two colors and a buzzworthy magnetic case, the iPad 2 could more than triple last year’s sales debut and reach a million units over the weekend, one analyst believes. Brian White with Ticonderoga Securities said in a note to investors on Friday that he “would not be surprised” if sales of the iPad 2 reach 1 million over the weekend. That would easily best last year’s sales of 1 million in just 28 days. 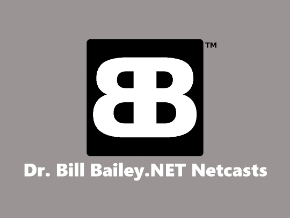 Geek Software of the Week: Blubrry Powerpress! Full iTunes Support: Adds iTunes compliant podcast feeds to your WordPress blog. 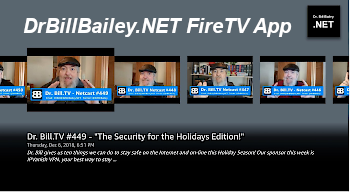 Integrated HTML5 and Flash Media Players: Audio/video web players with embed support from sites such as YouTube and Ustream.tv. Media Modifiers: Easily add, modify and remove podcasts form blog posts and pages. Migration tools: Quickly migrate from PodPress, Blogger or Movable Type without losing episodes. Multi-podcast support: Create separate podcasts by category (category casting) or by media format (Podcast Channels). Supported Media Formats: mp3, m4a, mp4, m4v, webm, ogg, oga, ogv, wma, ra, mp4a, m4v, mp4v, mpg, asf, avi, wmv, flv, swf, mov, divx, 3gp, midi, wav, aa, pdf, torrent, m4b, m4r. 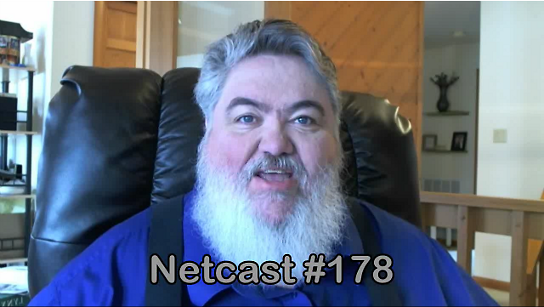 I have converted our Netcast category here on the Blog to use Powerpress! Google’s Chrome Browser Beats Hackers for 3rd Year Straight! I knew there were a lot more reasons to love Google Chrome, my favorite browser! At “Pwn2Own” at the CanSecWest security conference participating hackers attempted to hack the major browsers in the field: Internet Explorer, Firefox, Safari, and Chrome. The idea being that the first team of hackers to be able to do it woudl win a $15,000 prize AND the new computer that they were using at the conference to do the hacking! Sounds cool! BUT… Chrome was not hackable! Dewd! THAT rocks! Why couldn’t they do it? Because the Chrome browser has a “sandbox” that things run in… which creates an isolated area of memory to run in. Cool stuff! Techpodcasts Network Member podcasts, Google Gmail users lose data, but get it back, GSotW: Kaspersky Rescue Disk 10, IPv6 Factoid, computers with emotions? 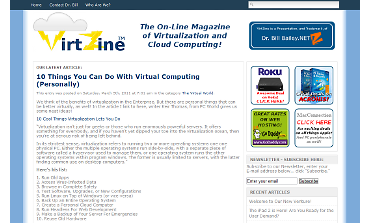 Announcing VirtZine, the On-Line Magazine of Virtualization and Cloud Computing! VirtZine – The On-Line Magazine of Virtualization and Cloud Computing! I know, I know, ONE more thing! I am already too busy! But hey! You gotta go with your interests, what motivates and excites you! Watch for what we will be doing, AND be sure to subscribe to the Newsletter! (Over on the right column of the VirZine web site…) We will keep you updated on plans there! Yep, it is back. Google blamed a software upgrade on losing some of it’s “Cloud based” data stores. While only 2% of users were hit, it is still a cautionary tale! Things CAN go wrong in computing! I kinda feel for them, actually! But, service, and data, have been restored, so my guess is, that, with time, this too shall pass! Hang in there Google! Developing Computers With Emotions… A Good Thing? “Researchers and startups have begun to focus on the final frontier for our silicon-based buddies — teaching computers to read and respond to human emotions. They haven’t quite designed a real life Andrew from the Bicentennial Man, but they have lead computers to grasp the basics. At Cambridge University in England, they are trying to teach computers to measure stress, detect how it effects facial expressions and then to interact using a persona that mimics a proper emotional response. Basically, they are building an emotionally sensitive computer. Researchers at Cambridge are building Andrew’s precursor. With IPv6 there are 340 undecillion addresses, or 64 billion IPs for every square centimeter on earth! Geek Software of the Week: Kaspersky Rescue Disk 10! I had someone at work ask me if I knew of a bootable CD that would find and fix viruses on a blue-screened PC. Well, I found one on-line! It is maintained by Kaspersky Anti-Virus. “Kaspersky Rescue Disk 10 is designed to scan, disinfect and restore infected operating systems. It should be used when it is impossible to boot the operating system. 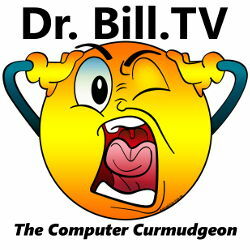 NOTE: I got word back today (03/02/2011) that my co-worker took this disk home, booted the PC that blue-screened with it, and it scanned and found the virus, cleaned it off, and when he rebooted… ta da! It came up and is fine! A good report! Some Google users have lost their address books, and other data, but it SHOULD be restored soon. No update had been provided as to if the issue had been fully resolved, although the company noted the issue affected only .08% of the total Gmail user base. Those struck by the outage noted that messages, chat histories, and contacts appeared to be missing. In some cases, the accounts appeared as if they had been wiped. The problem first appeared around 3:09pm Sunday afternoon according to Google.